I have a small business which focusses on making real estate more durable with the use of heat pumps, solar panels, insulation, etc. We give advices about these products and place it as well, with several technicians. Now I did buy a small car for in the city to drive from customer to customer to explain and sell our services. The car is white and I want to have a cool, unique design which stands out on such a small car! The design I needs to be printable on a sticker which I could order locally and let them place it on the car. In the appendix I uploaded a picture of my brand and the car. For more information, send me a message and we can figure it out. How do you mean what company? 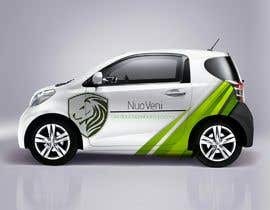 I put up my logo and my website is (www.nuoveni.nl) we are in durability and I need a car design which suits the company, think of a green roof and logo's on the car. But not a basic design. Haider, the Car is an Toyota IQ, I don't need pictures of a car, I need a sticker design for the Toyota IQ... ?